I am going to guess that each one of those words put an image in your mind. Those five words are examples of onomatopoeia. To keep the explanation simple, onomatopoeia is a "sound word" of the object it is referencing; thus, "moo!" references the sound of a cow. If you have a boy that loves monster trucks, most likely he makes many references of sound words as the monster trucks run into objects and/or each other! Or perhaps you have a child that loves playing in his/her toy kitchen--- the "sizzle, sizzle" of a frying pan or the "ding!" of the microwave are also examples of onomatopoeia that happen during play. The use of Onomatopoeia is found in various forms of literature, most often poetry. 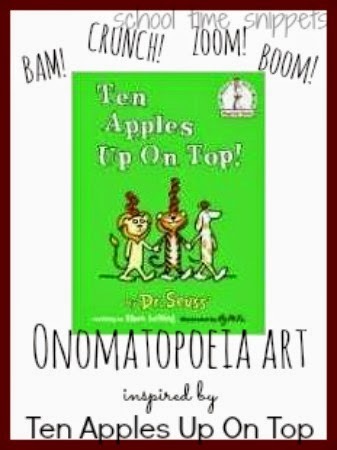 However, while reading Dr. Seuss's book, 10 Apples Up on Top, there was a page that worked perfectly in learning about onomatopoeia! If you are familiar with the story, it is when the three main characters realize that: "all their apple fun is going to stop. All their apples are going to drop!" The following page of the chaos that ensues is the perfect example of using and explaining onomatopoeia. After Big Brother and I talked about different examples of onomatopoeia, Big Brother and I grabbed some pastels and I encouraged Big Brother to re-create the scene and then add in sound words to describe what was happening! I joined in the fun, too! While I was re-creating the scene I'd let out a "boom!" and a "bang!" to help my son connect the sound word to what was happening in our picture. Combining art into our learning was so much fun! Do you combine subjects when learning? And still feeling "artsy," we made some Truffula Trees inspired by Dr. Seuss's, The Lorax! Are you a fan of the book, 10 Apples Up On Top? Hope you enjoy learning with Dr. Seuss as much as we do!! Looking for more Dr. Seuss Ideas?